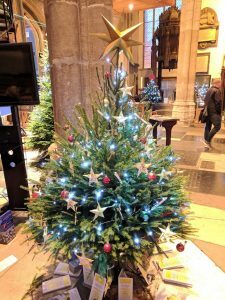 News – "Providing Access to Justice and Equality"
We were pleased to have the opportunity to decorate a tree for this years festival at St Peter Mancroft Church in Norwich, organised by the Rotary Club. Along with stars made out of our logo we also have gold painted scales of justice, judges gabbles and scrolls to represent a legal theme. Other trees at the festival were decorated by local organisation including Leeway, Nelson’s Journey, Norwich City Football Club, Steeles Law, Jarrolds and John Lewis. The festival was free to visit, but donations were welcome and all funds raised went towards supporting Norfolk Blood Bikes. Thank you to the over 200 sign-ups for the Norwich Legal Walk on Thursday 7 June 2018 – with over 160 attending in the end, this was the biggest Legal Walk yet. With around double the participants, the Access to Justice Foundation and Eastern Legal Support Trust (“ELST”) hope that we can smash the £5,000 fundraising target, which we have yet to do in our six years of organising Legal Walks in our fine city. Participants joined us from chambers, private practice, charitable organisations and quasi-legal departments to raise funds for the ELST, which allocates funding to various charities across the region including NCLS. Many of the participating teams also chose to raise 50% of their funds directly in aid of NCLS and we are very grateful for this. Leading the walkers were Charles Watt, the High Sheriff of Norfolk, Mike Napier CBE QC, Jacqueline Lake, the Norfolk Coroner, and Sue Bailey, Norfolk & Norwich Law Society President. Mr Watt thanked the walkers for their dedication to improving the lives of others through participating and fundraising in aid of access to justice. Ros Brown, NCLS Chief Executive, also thanked walkers and the ELST for their continued support, particularly as pro bono lawyers on NCLS’ advising rotas. Walkers enjoyed Grosvenor’s fish or sausage and chips at the Birdcage pub, kindly sponsored by Olsen Recruitment, Norwich & Norfolk Law Society and the ELST. After a hearty 10km walk following a long day at walk, the food was greatly appreciated by all! Norfolk Community Law Service (NCLS) is celebrating the success of its volunteering scheme as former volunteer and UEA Law student Naomi Newell returns as a qualified solicitor to give legal advice for free. Judi Lincoln, NCLS Advice & Volunteer Manager, said ‘We are delighted that Naomi’s volunteering experience with NCLS has contributed to her successful qualification as a solicitor and are very pleased to welcome her back to advise the increasing numbers of clients seeking help. Naomi, a qualified Dispute Resolution Solicitor with Norwich firm Cozens Hardy Solicitors, volunteered with NCLS throughout her 4 years as a student at UEA. 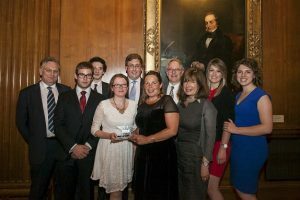 Naomi said ‘It is more important now than ever before that the legal profession does its bit for charities that provide much-needed free legal advice to the local community. I was fortunate enough to be involved with the volunteer scheme at NCLS when I was an undergraduate Law student at the UEA and I am thrilled to work for Cozens-Hardy LLP, which also supports NCLS. It was a very proud moment for me to sign my NCLS application form to enter onto the rota as a qualified solicitor after having started my degree in 2010 and I very much look forward to contributing, along with the other solicitors, to helping our local community. NCLS hopes that Naomi’s application will be the first of a number of student volunteers who will return as successfully qualified solicitors. Chris completed the marathon in 3 hours and 44 minutes and so far has raised £440 for NCLS. Thank you Chris and well done! Our CEO, Ros Brown, talks in the Solicitors Journal about the challenges bought about by cuts to Legal Aid and how NCLS is working to fil the gaps left by these cuts. The article also features ISCRE, who provide our Discrimination Advice Service. The work of NCLS in providing free legal advice was mentioned by Lord Howarth of Newport (Lab) in his Motion to take Note of the Cuts to Legal Aid. Whilst highlighting the problems that the cuts are bringing Lord Howarth said ‘Organisations such as the Norfolk Community Law Service are fighting back, for example by providing work experience for law students in their free legal advice services. But voluntary and pro bono work is no substitute for legal aid’. It is great that the hard and valuable work of NCLS and its volunteers is being recognised during the period of change bought on by the transformation of Legal Aid. A full transcript of the Motion can be found here. The Norfolk Community Law Service Welfare Benefits team is delighted to announce that December 2014 saw the Welfare Benefits service reach the impressive £1,000,000 milestone, in terms of income generated for our clients by overturning negative benefit decisions. Since it was established in October 2012, the Welfare Benefits service has advised 1,082 clients about their social security appeals and has represented 214 clients before the First-tier Tribunal. We have also helped many more clients achieve favourable outcomes without the need to go all the way to a tribunal. The service has made great use of the innovative partnership arrangement with the University of East Anglia’s Law School, which enables students from the UEA Law Clinic to volunteer for NCLS in various roles. The Welfare Benefits team trains students to represent clients at tribunals, with others trained in an administrative support role to work alongside our paid advisers. The team is looking forwards to a busy and successful 2015. We are happy to receive referrals from other agencies, via the Norfolk Community Advice Network partnership, and directly from clients for advice regarding their social security appeals.